Spectacular Aysgarth Falls consist of a triple flight of waterfalls in a wooded gorge of the River Ure near the village of Aysgarth in the Yorkshire Dales. The highly impressive falls continue for almost a mile of the river as the water descends over broad limestone steps into Wensleydale. 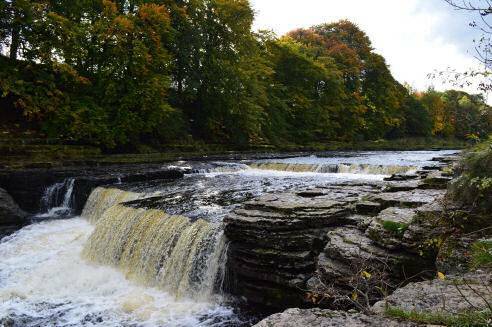 Although not particularly high the waterfalls are one of Wensleydale's most famed beauty spots. The falls are a product of the Ice Age, several thousand years ago, when great rivers of ice eroded the valley. 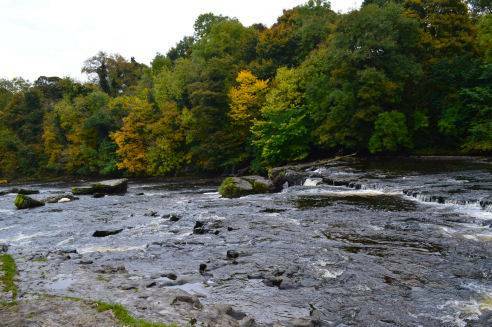 The name Aysgarth derives from from the old Norse language and means 'the open space in the oak trees'. The Falls have been a popular visitor attraction for over 200 years; John Ruskin, the artist Joseph Turner and the poet William Wordsworth all visited. The famous fight scene with Little John in 'Robin Hood, Prince of Thieves' was filmed at the upper falls. There are also walks through the ancient Freeholders Wood, which offers views of the river and falls. A variety of wild flowers are in bloom in the spring and summer months. Wild birds, squirrels and deer may also be sighted. 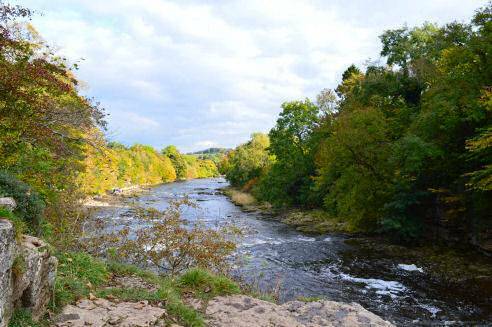 The River Ure contains brown trout, grayling and the native white-clawed crayfish. Salmon used to be seen jumping the falls. There is a variety of birdlife including kingfisher, wagtails and dippers. 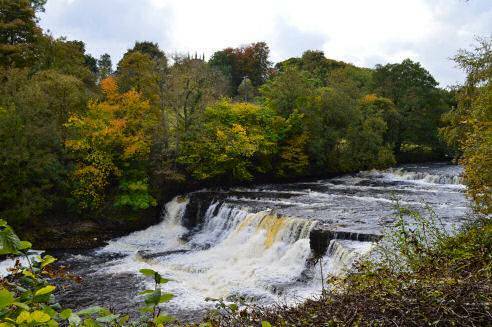 Parking is available at Aysgarth Falls National Park Centre. The village of Aysgarth lies along the A684 road near the south bank of the River Ure. It is mentioned in the Domesday Book of 1086 as 'Echescard'. At the time of the Norman conquest, the manor was held by Cnut, son of Karli. Later the manor was in the possession of Count Alan of Brittany, who granted lordship to Geoffrey of Swaffham. 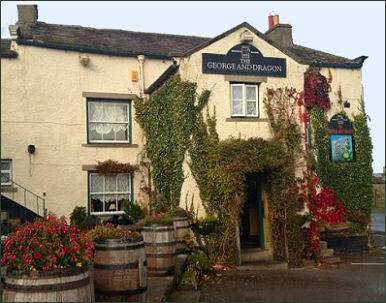 The George and Dragon Inn in the village dates from the seventeenth century when it was a coaching inn. St. Andrew's Church in Aysgarth was substantially rebuilt in 1536, and restored in 1866. The large churchyard extends to about four acres. 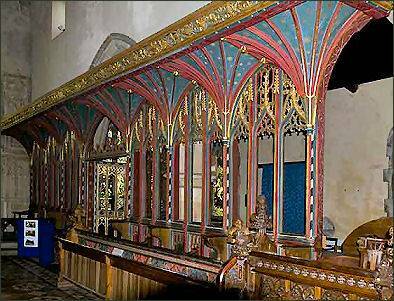 The church preserves a number of fittings that were rescued from Jervaulx Abbey at the time of the Dissolution of the Monasteries, including a rood screen and the abbot's stall. Aysgarth Edwardian Rock Garden must be one of the most unusual Listed Buildings in the Yorkshire Dales. It was commissioned in the years before the First World War by Frank Sayer-Graham who owned the cottage opposite. Messrs J Backhouse & Son of York was brought in to design and build the rock garden and construction began in 1906.